The X-38 Space Escape was designed to act as a crew return vehicle of the International Space Station. It had been regularly monitored by a drop test in order to ensure the safety of returning crew members to Earth. There are at least seven crewmembers that can board the escape shuttle. The main purpose of the vehicle was to enable space-bound scientists or researchers to make a quick journey back to Earth during those times when a medical emergency or other complications occur in the middle of a mission. It was built with a steerable par foil designed to create a more subtle earth landing since its moving speed was quite fast—thereby posing enough threats to land safely. 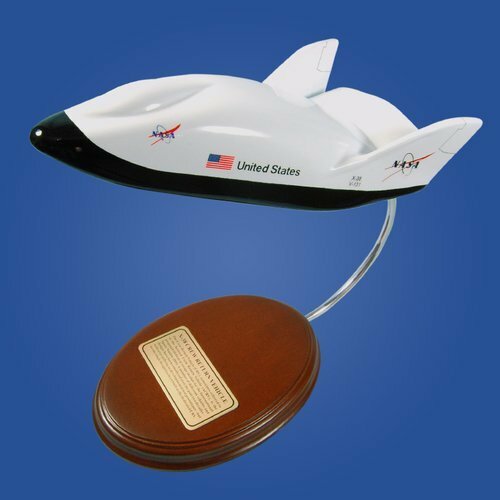 Get instant bragging rights with this space shuttle model as a new addition to your aviation-themed collection. Be a natural crowd-drawer and earn admiration from family and friends. With this NASA aircraft model display, you have nothing lose but more to gain.